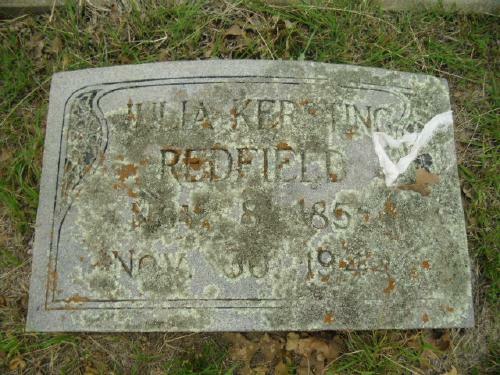 "Texas Births and Christenings, 1840-1981," database, FamilySearch (https://familysearch.org/ark:/61903/1:1:VRSB-NG9 : 8 December 2014), Elmira Levina Redfield, 28 May 1876; citing , BASTROP, TEXAS, reference ; FHL microfilm 1,548,039. "United States Census, 1900," database with images, FamilySearch (https://familysearch.org/ark:/61903/1:1:M3PZ-51C : 22 January 2015), Julia Redfield, Justice Precinct 1 (all north & east of H&TC r.r.) 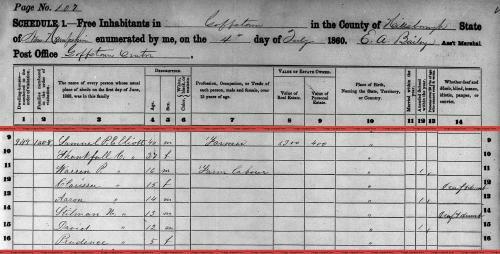 Giddings town, Lee, Texas, United States; citing sheet 1B, family 22, NARA microfilm publication T623 (Washington, D.C.: National Archives and Records Administration, n.d.); FHL microfilm 1,241,654. "Texas Deaths, 1890-1976," database with images, FamilySearch (https://familysearch.org/ark:/61903/1:1:K39R-VP1 : 5 December 2014), Hattie Ball, 11 Nov 1948; citing certificate number 47419, State Registrar Office, Austin; FHL microfilm 2,223,076. 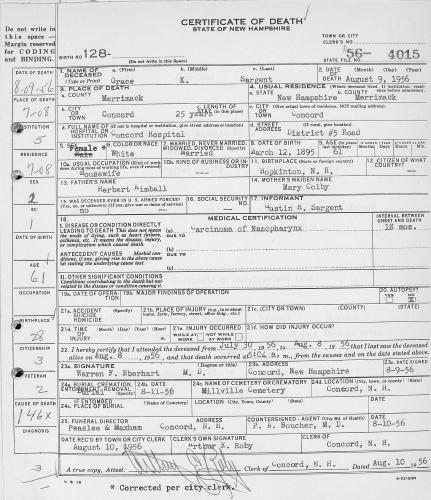 "Texas Deaths, 1890-1976," database with images, FamilySearch (https://familysearch.org/ark:/61903/1:1:K366-RC3 : 5 December 2014), Bettie Vogel, 11 Aug 1971; citing certificate number 58456, State Registrar Office, Austin; FHL microfilm 2,223,314. Arthur H. Kibbe was born perhaps about 1864.
living at Goffstown, Hillsborough County, New Hampshire. 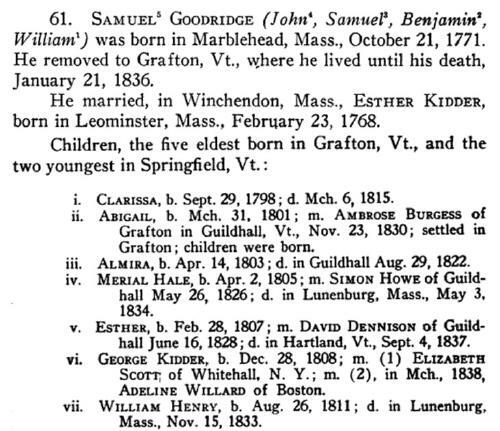 "New Hampshire, Birth Records, Early to 1900," index and images, FamilySearch (https://familysearch.org/pal:/MM9.1.1/FLLP-9R4 : accessed 24 Nov 2012), Thankful T Elliot, 28 Jul 1822. Vital Records of Topsfield Massachusetts to the end of the year 1849, Topsfield, Mass. : Topsfield Historical Society, (1903) , p. 63. Vital Records of Andover Massachusetts to the end of the year 1849, Topsfield, Mass. : Topsfield Historical Society, (1912) , p. 238. 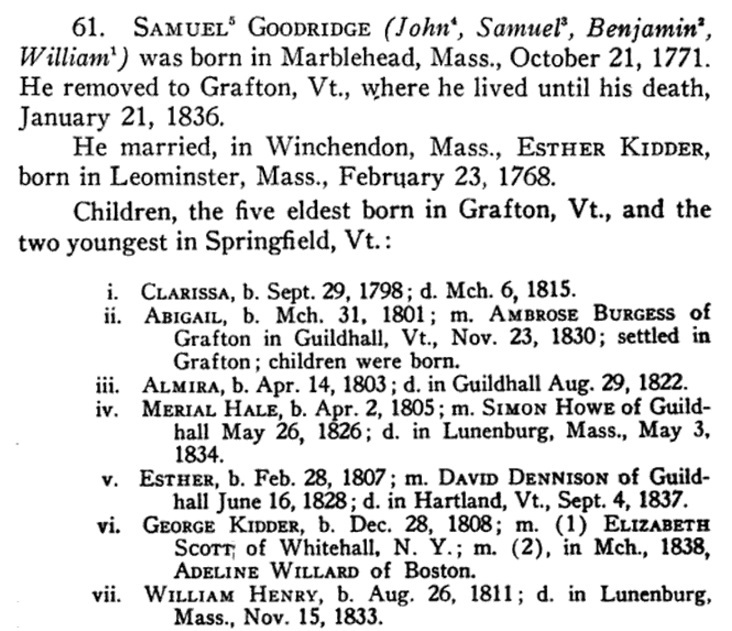 Walter Goodwin Davis and Gary Boyd Roberts, Massachusetts and Maine Families in the Ancestry of Walter Goodwin Davis (1885-1966): Neal-Wright, , at https://books.google.com/books?id=329GAAAAMAAJ . Baltimore, Md. : Genealogical Publishing Co., (1996) , p. 337. Walter Goodwin Davis and Gary Boyd Roberts, Massachusetts and Maine Families in the Ancestry of Walter Goodwin Davis (1885-1966): Neal-Wright, , at https://books.google.com/books?id=329GAAAAMAAJ . Baltimore, Md. : Genealogical Publishing Co., (1996) , p. 338. He was the son of Herbert M. Kimball and Mary Abbey Colby. 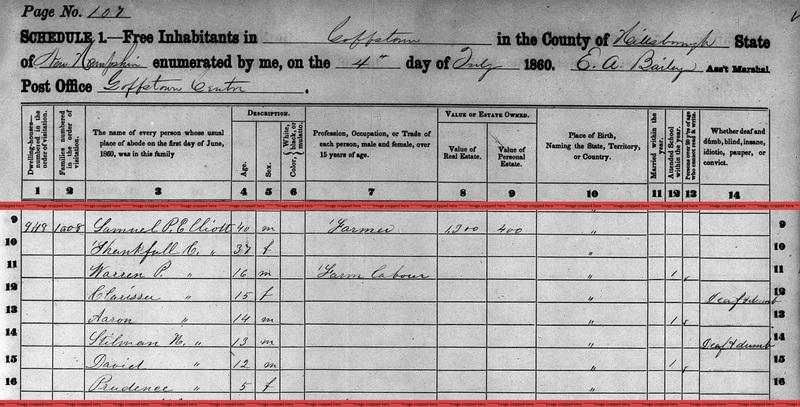 "United States Census, 1900," index and images, FamilySearch (https://familysearch.org/pal:/MM9.1.1/M3YD-244 : accessed 4 March 2015), Herbert M Kimball, Hopkinton town, Merrimack, New Hampshire, United States; citing sheet 3B, family 58, NARA microfilm publication T623 (Washington, D.C.: National Archives and Records Administration, n.d.); FHL microfilm 1,240,949. She was the daughter of Herbert M. Kimball and Mary Abbey Colby. 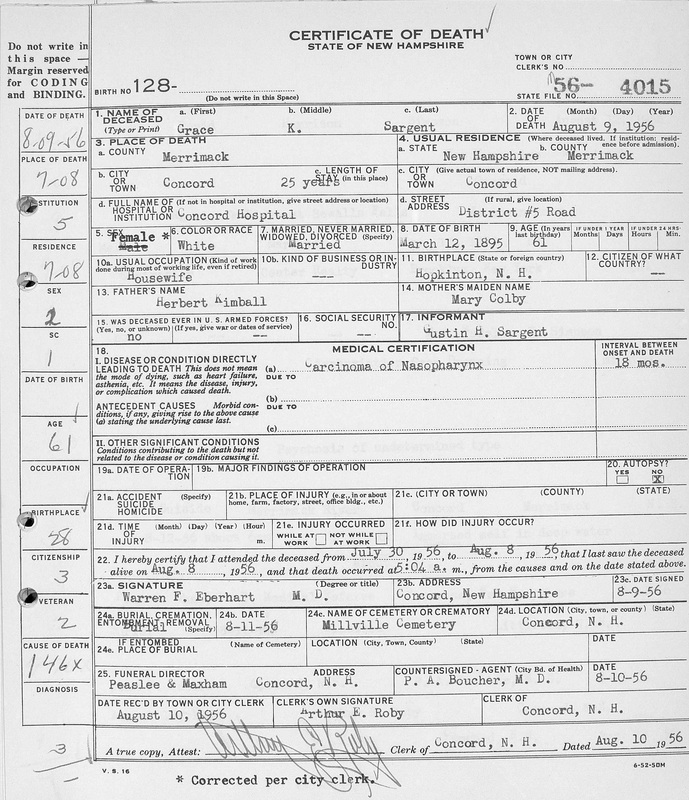 "New Hampshire, Death Certificates, 1938-1959," index and images, FamilySearch (https://familysearch.org/pal:/MM9.1.1/QV3Q-BLQH : accessed 4 March 2015), Grace K Sargent, 09 Aug 1956; citing Concord, Merrimack, New Hampshire, United States, p. No 3760-4306, New Hampshire Division of Vital Records, Concord.